eCite - Does spirometry training in general practice improve quality and outcomes of asthma care? 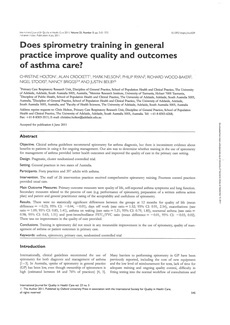 Does spirometry training in general practice improve quality and outcomes of asthma care? Copyright 2011 Oxford University Press. Objective. Clinical asthma guidelines recommend spirometry for asthma diagnosis, but there is inconsistent evidence about benefits to patients in using it for ongoing management. Our aim was to determine whether training in the use of spirometry for management of asthma provided better health outcomes and improved the quality of care in the primary care setting. Design. Pragmatic, cluster randomized controlled trial. Setting. General practices in two states of Australia. Participants. Forty practices and 397 adults with asthma. Intervention. The staff of 26 intervention practices received comprehensive spirometry training. Fourteen control practices provided usual care. Main Outcome Measures. Primary outcome measures were quality of life, self-reported asthma symptoms and lung function. Secondary measures related to the process of care (e.g. performance of spirometry, preparation of a written asthma action plan) and patient and general practitioner rating of the acceptability and usefulness of spirometry. Results. There were no statistically significant differences between the groups at 12 months for quality of life (mean difference ¼ 20.23; 95% CI: 20.44, 20.01), days off work (rate ratio ¼ 1.52; 95% CI: 0.91, 2.54), exacerbations (rate ratio ¼ 1.09; 95% CI: 0.85, 1.41), asthma on waking (rate ratio ¼ 1.21; 95% CI: 0.79, 1.85), nocturnal asthma (rate ratio ¼ 0.98; 95% CI: 0.63, 1.51) and post-bronchodilator FEV1/FVC ratio (mean difference ¼ 20.01, 95% CI: 20.03, 0.02). There was no improvement in the quality of care provided. Conclusions. Training in spirometry did not result in any measurable improvement in the use of spirometry, quality of management of asthma or patient outcomes in primary care.